A berry grown in clusters on the vine-like pepper plant that is used as a spice. The black peppercorn, which has the most pungent flavor of the peppercorns (white, green or black), is picked when it is slightly under ripe, then dried until the skin shrivels and turns dark brown or black. 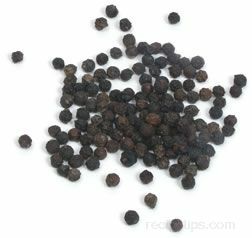 The most flavorful black peppercorn is the Tellicherry, since it remains on the vine longer before being harvested, thus retaining more of its flavor. Other varieties include the Sarawak, Malabar and the Vietnamese.